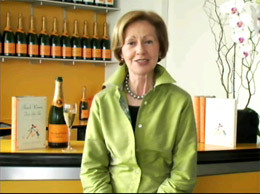 Click here to watch Mireille Guiliano introduce French Women Don?t Get Fat to Amazon customers. Click here to learn how to create your own reading group around French Women Don?t Get Fat. N.B. For a wonderful t��te-��-t��te romantic dinner, serve one hen each with a vegetable then dessert. I have prepared it successfully to my husband on Valentine?s Day. While the hens are in the oven, you have time to concoct a little dessert, et voil��, you can pop a cork of bubbly, sit for candlelight dinner and have your husband serve dessert. During the season of overindulgences?Christmas, New Year and all the festivities in between?there is in our home a succession of store-brought, traditional goodies: B?che de No?l (yule log), marrons glac��s (glazed chestnuts), the 13 desserts of Christmas in Provence. This is not to say that the holidays don?t bring out the baker in all of us, but whether it is to give as gifts or to maintain tradition, people do load up with holiday sweets from pastry shops (as I can attest from seeing from the window of our Paris apartment the annual long lines of people outside the pastry shop across the street). When I grew up, however, come New Year?s Day, and there was a home-cooked chocolate ritual. Our big festive meal was on New Year?s Eve, which left New Year?s Day as a quiet, family "recovery" day. (I appreciate some reverse the big meal day? or have one both days.) Anyway, for us, breakfast was well? late (especially for those of us who went partying after dinner), and limited to a piece of toast and a cup or two of coffee. Lunch was mid afternoon and usually made up of leftovers or an omelet, but the first dinner of the year was marked with a special dessert. The simple meal at the end of a week of overindulgences consisted of a light consomm��, some greens, cheese, and the chocolate treat. There were no guests, plenty of time, and Mamie was ready for the flourless souffl��. She is a chocoholic and it would be unthinkable to start the year off without chocolate. So, what better way to end the first day of the New Year than with one of her favorite chocolate desserts as both a reward and I?m sure good-luck charm? 1. Preheat the oven to 350 degrees and prepare a 1-quart souffl�� mold by lightly buttering it, dusting the insides with sugar and tapping out the excess. Place mold in refrigerator. 4. Beat the egg whites until they reach soft peaks. Add the salt and beat until stiff. Whisk half of the egg whites mixture into the chocolate mixture. Fold in the remaining whites gently with a spatula. Pour the mixture in the souffl�� mold and smooth the top. 2. Put the spinach in the center of each square and top it with a tablespoon of cr��me fra?che. Top with two fillets and add one teaspoon of shallots, two slices of lime. Season with salt and pepper. 2. In a heavy saucepan, gently saut�� the shallots in olive oil until they begin to turn gold. Add peas and asparagus and cook for a few minutes. 1. Peel the pears and cut into small cubes. Melt butter in a saucepan and saut�� the pear cubes for 2-3 minutes. 2. Arrange pear cubes on brioche slices. Cover with honey and almonds. Put under broiler for two minutes watching carefully. Serve warm with a dollop of sour cream or cr��me fra?che. Stylish, convincing, wise, funny&#8211;and just in time: the ultimate non-diet book, which could radically change the way you think and live. French women don&#8217;t get fat, but they do eat bread and pastry, drink wine, and regularly enjoy three-course meals. In her delightful tale, Mireille Guiliano unlocks the simple secrets of this &#8220;French paradox&#8221;&#8211;how to enjoy food and stay slim and healthy. Hers is a charming, sensible, and powerfully life-affirming view of health and eating for our times. As a typically slender French girl, Mireille (Meer-ray) went to America as an exchange student and came back fat. That shock sent her into an adolescent tailspin, until her kindly family physician, &#8220;Dr. Miracle,&#8221; came to the rescue. Reintroducing her to classic principles of French gastronomy plus time-honored secrets of the local women, he helped her restore her shape and gave her a whole new understanding of food, drink, and life. The key? Not guilt or deprivation but learning to get the most from the things you most enjoy. Following her own version of this traditional wisdom, she has ever since relished a life of indulgence without bulge, satisfying yen without yo-yo on three meals a day. Now in simple but potent strategies and dozens of recipes you&#8217;d swear were fattening, Mireille reveals the ingredients for a lifetime of weight control&#8211;from the emergency weekend remedy of Magical Leek Soup to everyday tricks like fooling yourself into contentment and painless new physical exertions to save you from the StairMaster. Emphasizing the virtues of freshness, variety, balance, and always pleasure, Mireille shows how virtually anyone can learn to eat, drink, and move like a French woman. A natural raconteur, Mireille illustrates her philosophy through the experiences that have shaped her life&#8211;a six-year-old&#8217;s first taste of Champagne, treks in search of tiny blueberries (called myrtilles) in the woods near her grandmother&#8217;s house, a near-spiritual rendezvous with oysters at a seaside restaurant in Brittany, to name but a few. She also shows us other women discovering the wonders of &#8220;French in action,&#8221; drawing examples from dozens of friends and associates she has advised over the years to eat and drink smarter and more joyfully. Here are a culture&#8217;s most cherished and time-honored secrets recast for the twenty-first century. For anyone who has slipped out of her zone, missed the flight to South Beach, or accidentally let a carb pass her lips, here is a buoyant, positive way to stay trim. A life of wine, bread&#8211;even chocolate&#8211;without girth or guilt? Pourquoi pas? A great book, everyone should read. It has a lot of wonderful insight to eating right. I don't believe in "diets". What I believe in, is eating healthy. Watching the amount you eat, how often you eat and what time of day you eat. Making good decision. Exercise. This book basically reiterates that with some helpful hints. It's been several years since I read the book, so I don't remember a lot of details about it. What I do remember, what I got out of it the most is to pay attention when you're eating. Have no distractions. I totally believe in this process, though I don't follow it. I have kids that often interrupt meals, and when they aren't around, I'm sharing my time eating, to also get in a little reading. But I am more aware of what I'm putting into my mouth as I eat, since reading the book. The other thing I got from this book is that dark chocolate is good for you...so to speak. And I LOVE dark chocolate, so I know have a stash in my refrigerator, and have a VERY small piece of it everyday. I truly believe this help satisfy any possible craving for "junk", as much as living by the rule, you should be able to indulge in some good/things that aren't necessarily good for you. Though it's all about quantity and moderation, and you must be making great choices the rest of the time, along with exercising. So, all in all, I felt there were several things in this book that were good enough that to this day, I still incorporate into my life. Therefore, I deem this book well worth the money I paid, and the time I spent reading it. I was very excited when I first got this book, but I grew more and more disappointed the more I read. The constant stereotyping was mildly irritating- yes, more Americans are overweight than the French, but we are not all the same, and we are certainly not stupid and do not need to be talked down to. Also, almost everything the author said was either common sense or just plain wrong. Anyone writing a book about weight loss who does not even know that fats and lipids are the same thing should NOT be taken seriously, and starting off on a diet of leeks only is NOT nutritionally sound. I would not recommend this book to anyone unless they are looking for a few French recipes. the best non-diet diet book ever! Yes, it's all absurdly simple, it's all common sense, but it's nice to be reminded how easy it can be to eat well. It's not expensive to eat well either. I'm on a limited budget - I can only spend $30/week on groceries so it does take some thought when you go shopping but with a little planning it's well worth it. Diet? Deprivation? Count calories? If this is your ideal way to lose weight, don't buy this book! Many millions of Americans diet . . . some join Jenny Craig or Weight Watchers, some diet through deprivation, some buy tiny little boxed meals high in sodium and low in nutrition. Then they watch with envy as their families enjoy a full meal with dessert, usually prepared by the starving dieter. Is it any wonder that we find ourselves losing, and then a year or two later gaining those pesky excess pounds right back? Since I have never visited France, I'm not sure if some French women have the same dilemma. I do know there are far fewer obese people in Europe than here in the U.S. The beauty of this book is that you don't have to be deprived of good food to diet. In fact, you will enjoy these recipes much more than your traditional American fare . . . cheeseburgers, fries, chocolate milk shake, etc., if you keep an open mind. Mireille shares her secrets and fabulous recipes, not asking us to give up our desserts, or our cream and butter. On page 86 she tells us many French people still eat their main meal at lunch. My lunch buddy and I adopted this idea in 2005 (prior to reading this book), and have been quite successful with weight control. I am 57 and I wear the same size as my 25 year old daughter . . . a size 6! Think I am just lucky . . . nope, I work pretty hard at it. But I don't count calories or eat salty tasteless food out of cardboard cartons. I eat "real food" prepared with herbs and other natural seasonings, a diet filled with legumes, whole grains, fruits, and vegetables. If you enjoy eating and cooking, this is a great book to have on your shelf. Buy it and enjoy food the way the French do! I finish this book feeling disappointed. Having lived in France for a year in college and having frequent contact with French friends, I find that the author makes too many generalizations about French women's eating habits. All she is really telling us is how to eat in moderation, which has nothing to do with being French. Also, the soup story is akin, in my opinion, to going on Slimfast for a weekend...there is nothing "magical" or French about it; it's simply a way to crash diet for a few days. Though there was some information about healthy French eating habits, I felt that this book was more of a diet book in disguise & what seemed to be passed off as being "French" was really just common sense (portion control, moving around more frequently, drinking more water, etc.). What I did enjoy about this book was her recognition of how the "eating lifestyle" is different in France in comparison to the US. The absence of frequent snacking, eating "bad foods" and not depriving oneself of them, and, most importantly, buying fresh foods and foods that are in season. I think Americans can definitely learn something from the French (and other cultures, for that matter) in this respect. Like others, I found the author to be quite condescending at times. She seems to turn her nose up at all of the bad habits we Americans have (including going to the gym!). But I have to say that I have not yet met a French person who subscribes entirely to what she is saying. She makes it sound as if all French think & do just like her. I was unsure about this book, but got it because I thought that I would like to cut out many of those unhealthy things found in many *diet* products. If I can't pronounce an ingredient (and I am a graduate school student, so my verbal comprehension is not a problem), I probably shouldn't eat it. I lost 15 pounds (down from 165) by trading my lean cuisines for super satifying cheese, crackers and apples. I dropped my low calorie oatmeal (with artificial sweeteners) and took up 9-grain cereal that not only tastes better, but keeps me full for longer. This book has become my diet bible and I return to it time and again, as a refresher in brilliant tips. This book was wonderful - it has already changed the way I interact with food and drink, and the way I think about my body. The author suggests a lot of practical lifestyle changes to show us how to implement her basic French philosophy of eating modest portions of very high-quality foods. She suggests drinking a lot of water, eaing mindfully and paying attention to every single bite, putting down your fork every few bites and savoring the flavors, making your food yourself from quality ingredients, eating seasonally so that you appreciate and taste the seasonal ingredients available at different times of year, drinking a modest amount of wine with dinner but cutting out hard liquer, and eating a good amount of fresh yogurt to help your digestion. She also recommends paying attention to presentation and making eating a more special activity, with candles, nice dishes, the TV off, and a mindfully appreciative way of eating. This sounds like good old fashioned common sense mixed with the wonderfully French way of eating seasonally so that you appreciate and notice the differences in flavor in your foods. She also recommends ways of incorporating movement into your daily life so you needn't hit the gym. I am a healthy weight, but I struggle sometimes with a tendancy to overeat, especially certain foods and at certain times of the year. I have already started putting her tips into practice in my life and have noticed how much more pleasurable eating is, and how I do actually feel satisfied with less. I am tricking myself into eating a bit less. Plus, since guilt is never a factor in the French relationship with food, I found that when I took the stigma out of eating good foods slowly, I was way less likely to overeat. Something about eating guiltily numbed my senses so I needed more of the indulgent treat to feel satisfied. I bought a copy for my best girlfriend and can't wait to hear her take on it. I am hoping we can both take on some of these loving and simple changes to our relationship with food, and enjoy the finer things of life together. I did not find the author's tone demeaning, offending, or annoying at all, because the fact of the matter is that on the average, Americans tend to have more weight problems than the French, although ironically enough, we are more obsessed with dieting than anyone else. And the average American diet is really not that great. I got this book for the recipes and meal ideas, but I know that what Ms. Guiliano says about weight control is true. After reading her book, I realized that for some reason, several years ago I started eating exactly the way she describes. I am not French, and this book wasn't even around back when I started, but I suppose I simply became disgusted with all the fake food that was around in those days (when fat-free was all the rage). I wanted real cheese and real butter, not plastic and chemicals. So I started eating real cheese and butter, on real bread, and enjoying it. That's the way I've been eating for years- enjoying good cheese, good chocolate, gooey pasta, white rice and bread whenever I please- yet I weigh less now than when I got married at age 20, and I am a mom nearing her thirties. So give this book a shot. I have just finished reading this book for the second time, I enjoyed it that much! I actually recently found an authentic French bakery in my neighborhood that I frequent for breads and little pastries for a treat. For those posters giving bad reviews, spending more time concerning themselves with Miss Guiliano's 'tone' throughout the book, rather than getting the message - buck up and get over yourselves. What she says is true and the truth hurts sometimes. Admit that you are wrong graciously. Don't be ignorant. A lot of Americans are fat, plain and simple. I especially worry about our nations children. Americans are as sedentary as a group of sloths, don't make good food choices, our food portions are too large, and we don't appreciate the food in front of us or give it the respect it deserves. The food you eat came to you through much suffering and hardship for those that painstakingly grew it and brought it to your market for your consumption. I suppose if we were all farmers we would appreciate it more. Appreciating what you're eating is what 'eating for pleasure' means. Its refreshingly different perspective from Cosmo and other women's magazines! You will not drop 10 pounds in 10 hours, its about balance and enjoying your life. Great recipes, well written, simply lovely. This book absolutely changed my life. I was SOOO obsessed with how much food I was eating and what I was eating, I was obsessed to the point where I could not enjoy what I ate, I regretted everything "bad" I put into my mouth and just was a mess because I love food! At age 55, people often tell me that they envy the way I can apparently eat anything I wish and stay slim. That isn't true, of course, any more than it is for anyone else. But when I was 19, I went to Paris and worked as an au pair for a year, and after the initial culture shock (no eggs and bacon for breakfast?! supper late and small? Lunch big and SLOW? ), I learned that I felt healthier and stronger when I ate in the classic French manner: exactly the diet and routine outlined in this book. For the past 35 years, whenever I feel a little sluggish or put on a few pounds, I return to eating in the French manner to the extent that this is possible in the United States. That is the real crunch, as mentioned by a number of other reviewers. What is easy in France is difficult here. I live in an urban community where a nice grocery with fresh produce is a short walk away, and I can easily walk to the post office, library, movie theater, etc. I rarely go to a restaurant that is not within a 5 minute walk from my house, and I have a large variety to choose from. A small minority of Americans live in this context. But I did not always live here. When I have lived in more suburban areas, I thought about ways to simulate a similar life. Some things are easy: park at a small distance from your destination and walk the rest of the way. Get in the habit of stopping on the way home from work to purchase those few fresh fruits or vegetables that will make dinner special. Eat a smaller and later dinner, and do change plates between courses, even if only once. Those four extra plates per family of four are irrelevant, and the difference in eating habits is worth the little effort. Some things are hard: portion size in restaurants in the US is huge. Good produce can be hard to find and expensive. A smaller and later supper is not appropriate for a child or teen who had to wolf down a quick school lunch in the allotted 25 minutes. Ready-prepared food (usually caloric and bland, and often pumped with preservatives and unpronounceable ingredients) is prominently displayed in the grocery store and very tempting! In suburban areas without sidewalks, any walking at all is risky to one's life and limb. And most of us work more hours than the French and see the preparation of meals after a long day at work as a burden and not a creative process. That is even more true when we take into account that the average family dinner takes less than 15 minutes to devour, and that allows for little sense of pride in the meal that was prepared. Still, I have found over the years that it is worth the effort to emulate the traditional French lifestyle to the extent possible, even if that is sometimes limited to the weekends. When I get too far away from it for too long, I definitely can tell the difference; I have less energy, I feel bloated, and even my skin and hair look dull. A week of consciously living more like the French will revive me. Several reviewers have pointed out that the French themselves are getting away from these traditions and putting on weight as their lives become more like ours. This is true. It is also true that the French government and health care community see this as a cultural and health crisis, and serious efforts are taken to guide the French back to their traditional lifestyle. Alas, we Americans are held up as a bad example, and (also alas) this is entirely appropriate. Exporting our lifestyle has also exported the health and diet issues that are inescapable and unfortunate by-products. I feel that some people are taking this book too literally. This book, like any other diet book, is about changing some habits from unhealthy to healthy. And it promotes thinking about food in a different way, and using different ingredients than you normally would. I used to go to the farmers market every Saturday and buy loads of healthy food, and then let it all go to waste because I was either too lazy or uninspired to do anything with it. After reading this book I am planning my meals more, thinking about at least 3 different recipes I could use for one kind of fruit or vegetable when I buy them (to prevent waste), and balancing my meals better. Sure, sometimes it can come off as condescending, but what diet book doesn't? Um, isn't it obvious, they all smoke like chimneys! In all honesty, I lived with a French woman and I'll tell you how she stayed thin, 1 hour a day at the gym and she considered a "meal" one laughing cow cheese slice. Gosh, I just don't know how I feel about this. When I read it the first time, I thought it was great. I wasn't suffering from a huge weight problem, either, I just am interested in making my life better and more fulfilling. I really savored her advice, and I put a lot of it to use. A year later, which is now, I have reread it. In the meantime, I read a couple other books, had some life changes, and developed some newer and healthier ideas about food. Coming back to this book seemed like backtracking, after all of that. I guess what really gets me is that...even though French eating is all about pleasure, etc., it seems awful neurotic to be pleasureable, to me. I just want to eat my banana, not cut it up into microscopic slices. I want to eat a protein shake with flaxseed oil for health and that makes me enjoy it, even though it's not gourmet. That's intuitive to me, but not very French. So, for me, it's hard to follow her advice when I know a lot of her advice doesn't work for me, and seems really neurotic. Also, what are we striving for here? French women certainly have a certain je-ne-c'est-quoi (spelling??). But, I don't live in France. A lot of Americans I know, who are reasonable and open-minded, liberal people, men and women, think many American women are more attractive than French women. Personally, I don't want to look like a French woman. I am tall, muscular and toned, and French women aren't, typically. I want to have ripped abs and toned biceps...French women typically don't. So, I think it matters what you are shooting for, I am not shooting to look French. Also, how easy is it to maintain this lifestyle in America? Not very. Especially on a budget. It's all been said before but, I agree--no little farmers markets and fresh bakeries on every corner here, I can't walk everywhere, I can't dine on fresh exotic local meats every dinner. And, I have nothing against the Author. I am sure she is a lovely person. But, sometimes the tone was rather condescending and rude towards Americans. And very stereotypical. I don't know about you, but it's not like I am eating McDonalds and soda for every meal, and buying all my produce at mass food farms, and chowing down on wonder bread at every meal! And, of course, "wailing away on the cybex." I don't know that I've ever seen the infamous "cybex" she speaks of. And why would I "Wail away" on it? I found this book charmingly pretentious and condescending. It didn't tell me anything I didn't know already. About losing weight, that is. Walk. Drink water. Practice portion control. It did leave me feeling rather like a bumpkin, since I don't drink wine or champagne at meals on a daily basis. I came away feeling uncomfortably inferior to the superior French women. Yes, some French women are fat, just like everywhere else. But this book is not about the French being better, it's about our mindsets and attitudes towards food. Guiliano begins her book with the story of how her eating habits changed when she came to the U.S. on an exchange program, and how she had to reprogram herself when she returned. Aside from preaching about a few general healthy habits (drink lots of water, eat balanced meals and plenty of vegetables, etc), Guiliano is message is basically moderation, portion control, and enjoyment of life. Maintaining your weight should not be about denying yourself sweets or carbs (you should enjoy foods that you love! ), but it is important to think about how much we are eating! Enjoy that chocolate, but don't eat the whole bar. Enjoy bread, but don't eat 8 servings of it a day. She uses a combo of Intuitive Eating principles and diet tips. It's not "pure" IE because she does suggest (in the beginning of the program) to abstain from certain things. But over all, a pretty good read. Makes tons of sense. However, like IE, she doesn't promote abstaining forever from these foods, just in the beginning. Like Intuitive Eating, her basic moto seems to be eat a little less, and move a little more (progressively) until you reach your ideal body weight (the weight we're supposed to weigh, not what we want to weigh, just like IE). It's a pretty good read. I fully completely believe the reason that most Americans are over weight, can be directly blamed on the diet industry. We've been duped for years by a multi-billion dollar industry (do they REALLY want us to loose weight and take away their income? I don't think so!). I've been practicing Intuitive Eating for a couple of years, it works! It works without deprivation, without diet backlash, and without temptation. French Women Don't Get Fat is very close in principle and practice to Intuitive Eating. It really does work. But because most of us have been brainwashed by the diet industry to believe unless it hurts, we're not doing it right. If dieting was the answer, no one would be over weight. I highly recommend this read. "Living like a French woman" impractical for most Yanks. The book has some great recipes in it. But the woman is completely blind to her own pampered, entitled life and how very much she is the product of it. I'm sure it would be easier for Americans to look like French women -- if they, too, were allowed to go home at lunchtime and spend 2 hours preparing and slowly eating lunch before taking a nap and going back to work, walk to work, buy fresh bread and expensive organic veggies near home, spend weeks on vacation relaxing, AND have a career that consisted of getting well-paid to eat the best food and drink the best wine all over the world. I'd love to give her a freakin' MONTH of a typical American work-load, a typical salary and a typical grocery budget. I won't even saddle her with kids -- just a month of an American job, with an American commute, American lunch-time ("You were 2 minutes late getting back from your 30-minute break"), American work-hours, American vacation time, and the realization that, no, she really really CAN'T have Veuve Cliquot at lunchtime without getting fired from most American workplaces (assuming she makes enough to afford Veuve Cliquot). I started this book before I went to bed one night (I always have to read something before I go to sleep to unwind, though this one kept me up) and finished it upon waking the next morning. It is not worth the new price tag, but definitely worth the read. It's not much of a recipe book (though I found a few worth trying), but more of a pep talk, and a very good one, too, because I am inspired to cut my portions in half (though sans on the champagne--too expensive, not to mention totally unnecessary, but then I don't like the taste of alcohol anyway), eat more fruit, etc. Though recasting is just another word for fasting, it is something I will do the day before I begin my lifestyle change (to clean out my system so that I may start fresh), but my recasting menu will vary somewhat, maybe include several of those new Sunsweet Ones prunes, some fresh watermelon juice perhaps (oh, wait, it's out of season), etc. It's not that I don't like leeks, I've never had them, but I want to start with more familiar foods, foods I know I'll like, or else it'll feel like a diet. I was expecting, from some of the reviews I read, that Mrs. Guiliano would come across as a snob, but I actually didn't get that from her. She's just right about the way most Americans are, and it's hard to say how lazy they are without sounding insulting. Hey, I work in a grocery store and some customers will take something out of the freezer, but instead of putting it back if they decide they don't want it, they'll just leave it out. How hard is it to open a door? I am American, and I am disgusted by the fatness, laziness and rudeness (not to mention stupidity, but then, that's just stems from laziness sometimes because they'll ask me where something is when all they have to do is look) of some of the American population; I am even more disgusted when I see an obese child drinking a can of soda in the store and when they pass the doughnuts, ask their parents if they can get some and they say yes. I mean, can't they see how fat their kid(s) is(are)? What kills me is that their parents will say it's hereditary because they're fat, too, but then, they shovel all that junk into their bodies as well. I am not saying genetics don't pre-disposition you to a certain extent, but I believe that much more often than not, it's an excuse, because some people are just lucky and others have to work at it. Anyway, I thoroughly enjoyed this book, I felt like I was taking an imaginary trip to France. I found Mrs. Guiliano's opinion on gyms interesting. I, too, think gyms are a waste of time and money because you can exercise for free and many of those same people who pay for a gym membership are the very ones who drive around for ten minutes trying to squeeze into the closest parking space. I only park close when I'm on a time crunch or if it's late at night and I'm alone. I will admit I'll park close if a slot's available, but, after reading this book, I am going to make more of an effort. I have in the past, I just got lazy. But, I was thinking about how I dreaded going to the gym because it was so mind-numbingly boring and you have to get dressed, drive there, etc., when I could just jump on the trampoline at home or skip rope or do the hula hoop (which is GREAT for the abs). The Skip-It toy is also fun and really works the calves. If I lived in a two-story house, I would be going up and down the stairs all day (I feel silly on a machine) and if I knew how to ride a bicycle without training wheels, I would ride around the neighborhood (again, it's just not the same in a smelly, stuffy gym as it is outdoors, with the sunshine on my face and the breeze blowing through my hair). I do have a pair of roller-skates though. There's dancing, tennis, water aerobics, etc., etc. There are just so many more fun things to do than work out on a bunch of machines. We do not need special food (i.e. Slimfast, etc.) or fancy, expensive machines to be fit and healthy, not to mention eliminating entire food groups. Eat to live, but live a little. One ounce of real chocolate can provide as much pleasure as a Snickers bar, if we savor it. Just like it's better to consume one tablespoon of real butter than three of the fake stuff. We've become such an artificial society. We're meant to eat fat and work it off, not eat any and be sedentary. I think it was Mrs. Guiliano's enthusiasm for everything French and her great faith in her Parisian gospel she was sharing that really inspired me. I do, however, still think that for some peoples with slow metabolism, they need to do more than opt to take the stairs or walk across the parking lot whenever possible, even if they are eating French-style. Though the majority of France is trim, that doesn't necessarily mean they are strong or healthy (I don't know how many of those slender people could run a mile without gasping for breath afterwards), so I take that consideration into account. I am reminded of those women in those Nutra-System (I think those are the ones) commercials who act like the only reason they wanted to lose weight was so they could wear a bikini . I want to be trim not just because I want to look good, but I want to feel good, too. So...this book was well worth the six bucks (and hardback edition, too) to me, and worth keeping in my library, too, forsaking any trade-in credit I may get back for it. Having just returned from France, I can say that this book is undeniably written from that French point of view of extreme cultural pride, sometimes to the point of arrogance. I didn't read this book for dieting tips, I was simply curious as to how a French woman explained the "french paradox". Mireille's tone throughout the book is a bit stuck-up, and sometimes hypocritical. She criticizes diet books for their focus on eating just one food for days at a time, and then tells her readers to spend a weekend eating nothing but leek soup. She also completely over generalizes about both the French and American cultures. I took issue with her claim that the French drink little tea, except tisanes, because while I was in France my host family drank black tea all the time, and the super markets' varieties of black tea is further evidence of its presence in the food culture. But the one sentence that finally convinced me to write this review was "The French are probably the world's biggest soup drinkers." Now that is just completely wrong. I guess Mireille has never read about or sampled Korean cuisine, where soup is served at just about every single meal. I will only eat the finest foods, and oh so daintily manage to put in my mouth no more than a few bites! My palate will not withstand any but the most pristine of consumables: the finest, freshest, purest of fruits, vegetables, grains, and wine, interspersed with only the tiniest amounts of meats, cheeses, and decadent desserts (which I dare not finish!). Rather than allow sub-standard food to cross my lips, I would prefer to eat nothing at all! And even what I do condescend to consume, I will eat with great concentration, awareness, and restraint. Oh, and whenever I find a free moment in my day, I will use it to walk, walk, walk! "Kazakh women do not get fat or old "
"Kazakh women do not get fat or old or anything" this should have been the title of the next book in the series of stories how French/Japanese ("Japanese women do not get old or fat")/Kazakh /Other foreign women come to the US, gain 20-30 pounds, return home and loose all that baggage, in no time, thanks to local cuisine. By the way, anyone who has ever been to Almaty, Kazakhstan notes how slim and gorgeous are women there. I could share my story of abandoning unhealthy American food and going back to my roots, literally. But I would not. The truth is that after spending 2 years (guess where) in Alabama I lost one size and now I am a tiny size 00. I have never been in a better shape. The reason: I looked around and tagged along Alabamians at what Americans are the best: sports and organic food. There are lots of organic food stores and you can get great personal training for a very affordable price. Now that I moved to Paris I can see the difference, and I prefer my "D1" work - outs to those of the "Vit'Halles" . I remember when my dear chubby American friend asked me what do I do to stay so thing and young and I replied "Watch your diet," munching on a piece of bread spread with 100% fat homemade butter. It was organic, of course. Part healthy living guide, part memoir, this non-diet book is chock-full of great advice for weight control. I have lost over thirty pounds since reading this book almost two years ago, which has also been reread when I've felt myself slipping back into an American standard of eating. Even if you don't want to buy a yogurt machine or eat leeks for a weekend, this sage advice is well worth your time. As Madame Guiliano teaches us, the biggest "secrets" to maintaining a healthy weight are portion control and balanced eating. The "trick" is not deprivation, but indulgence in fine foods in portion-controlled amounts. Deprivation only leads to overindulgence later. Tantalize your taste buds! Yes, you can have the wine, the champagne, the rich food, and the few pieces of (high-quality) chocolate too! The biggest lesson on portion control: French women eat until they're satisfied. Americans eat until they're stuffed. You must learn to read the signals that tell you when you've had enough. As she shows us, both when and how are important for balance. If you had the bread at lunchtime, skip it at dinner. If you had the croissant for breakfast, balance it with vegetables at lunch and a piece of fruit mid-afternoon. Eat three healthy meals a day. If you eat well throughout the day, you will lose the need to gorge all night long. Madame Guiliano advises us that the most delectable portion of a course is in the first three bites. Go for the cup of soup, not the bowl. She also advises us to cultivate an appreciation for fresh foods that are in season, and to use them. As she notes, there is nothing more flavorless than a winter tomato, so why torture your taste buds by eating them? Other useful "rules" include: NEVER eat standing up, pay attention to presentation (every meal should be an experience), and don't rush through meals - pay attention to your food! Of course, French women walk everywhere, too, but we Americans don't need to be told we aren't moving enough. We all know it. We don't want to hear it, but we don't have an appreciation for how small things add up to big changes. Park your car at the furthest space away from the store, take the stairs instead of the elevator, walk from a store to the one next door instead of driving across the parking lot. It all adds up! I know some of this doesn't sound new, but what Madame Guiliano teaches us is a new attitude toward food. This book has given me a renewed interest in cooking, and an appreciation of the freshest seasonal foods available. Whole Foods has become a staple for my produce and chocolate. I have dusted off my favorite cookbook and found dozens of easy recipes using spices I had never tried (I found her recipes a little too difficult, using ingredients I don't readily have at hand). Best of all, put these suggestions into action and enjoy a "joie de vivre" you've never experienced before! The list goes on. Most importantly: LOVING YOUR MEALS WHILE USING COMMON SENSE AT THE SAME TIME. I like "French Women..." for the pleasure of reading but I prefer "Can We Live 150..." for the comprehensive, detailed approach to nutrition, longevity and healthy life style. The advice shared in this book is fine. I have no quarrel with it. I will agree with some of the other reviewers that some of the strategies the author suggests come much easier if one lives in a city than if one lives in a rural area. However, adjustments can be made. However, her point about French women effortlessly controlling their weight is a myth from what I've observed. I lived on a French island, and believe you me, those French women watched every morsel they put into their mouth. Oftentimes, I would see women nibbling on a few slices of cataloupe and ham for lunch and that's it (far different from the indulgent lunches that the author describes). I knew of plenty of French people who went to the gym (and this is on an island, where they could have the choice of swimming or some other water sport). I thoroughly enjoyed reading this book. I am foreign and when I moved to the U.S. I was shocked by the prevailing attitude toward food and by the thousands of diets and low-fat/low-calorie products that you see everywhere. Nevetheless, it is difficult to live here and not fall into the trap of viewing food as an enemy rather than as nourishment and a sensual pleasure. Reading this book reminded me of the importance of having a healthy attitude toward food. Enjoying food with all your senses and eating what you love in regular (not American-sized) portions will undoutedly make you stay thin. In my opinion, people become overweight because they are so unsatisfied with the foods they eat and by all the restrictions that they put on themselves that they feel deprived and end up making up for this deprivation by eating 20 fake "low-fat" cookies instead of the creme brulee they really wanted. Also, because many use food as a drug that provides instant gratification, briefly numbs pain and is addictive. I love the way this book is written and the anecdotes Mireille Guiliano shares with her readers. 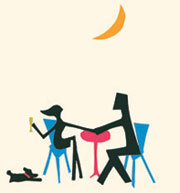 It is a fun book to read that reminds you that all aspects of life are meant to be savored and enjoyed. In other words, what good is it to be very thin if you got that way by being miserable, i.e., by spending 2 hours locked in a gym and then starving yourself and feeling constant guilt over your food choices? Life is too short to live it torturing oneself instead of loving every minute (and morsel) of it. I read this book about a year ago and I can't wait for her second book to be released. I pre-ordered it a month ago! 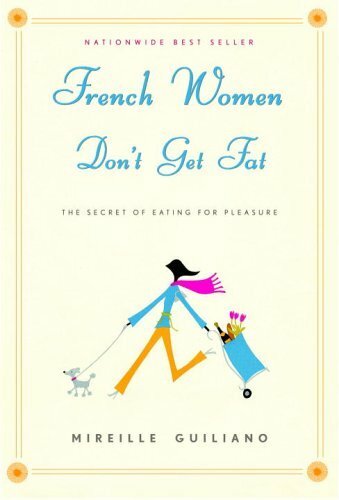 French Women Don't Get Fat is not your typical diet book, thank goodness. It is however, more of a philosophy of how one should approach food and life from the French perspective of author, Franco-American, Mireille Guiliano. She recommends a more relaxed approach to food consumption and preparation with less emphasis on what you can't have and more emphasis on enjoying the food you do eat, choosing smaller portions with bigger flavor. French Women Don't Get Fat also contains fifty-five recipes that range from the exotic, like Fingers and Caviar and Duck Breasts A La Gasconne, to more simple fare of Lentil Soup and Baked Apples. There are also recipes for making homemade yogurt. I found most, but not all of the recipes contain ingredients the average American kitchen would have on hand. I found the book a bit of a slow read, but the principles are sound enough. As every dieter knows, losing weight requires increasing activity and limiting portions. The difference is the author also reminds the reader that diets don't work; therefore you have to make long-term changes that will work for your lifestyle and tastes. She suggests staying away from fast food and hunger cravings by eating good food in season, prepared well, which is the best way to eliminate the boredoms, and mindless eating resulting in the inevitable weight gain. If you are looking for a non-typical diet book with interesting new recipes and French wisdom for getting slim and staying that way-then you will enjoy French Women Don't Get Fat.